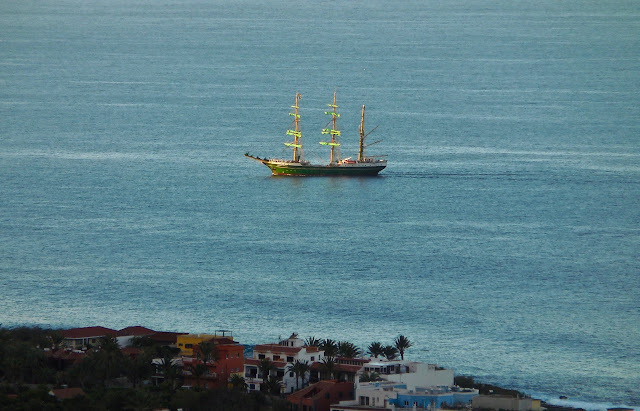 News, Views, Info,Weather, and more about the hidden gem La Gomera, and the Canary Islands. Ads-free. INDEPENDENT. 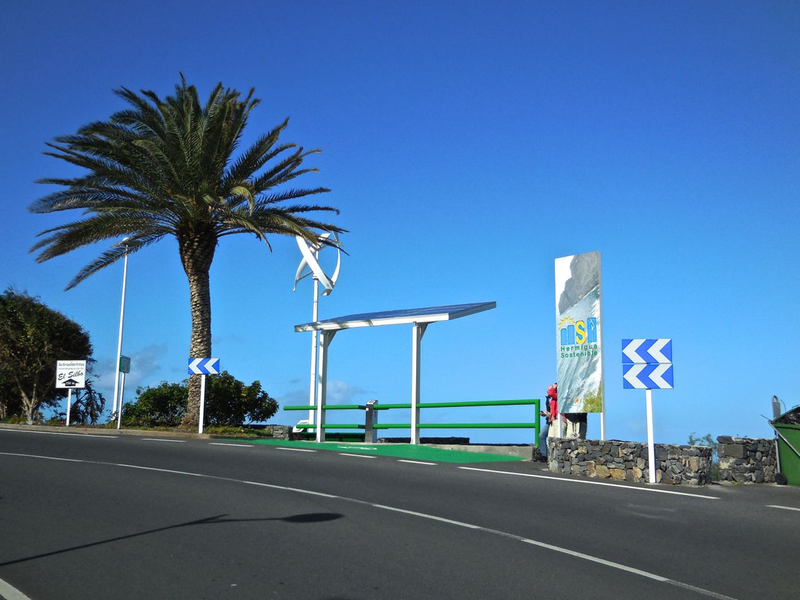 La Gomera's island government has provisionally approved the allocation of initially 500.000 Euros in subsidies for the installation of photo-voltaic panels by private house owners and businesses. Grants of up to 60% of the cost of the installation of solar energy systems will be paid out with a maximum of 12.000 Euros for small to medium enterprises and up to 24.000 Euros for private household installations. This announcement by the island's president Casimiro Curbelo was made last Friday and is a further step towards La Gomera's ambitious plan towards becoming independent of external energy sources. This well-intentioned plan has sadly suffered delays in the past due to the energy-supplying companies dragging their feet while their ageing diesel-powered electricity generating station keeps belching out thick smoke in the island's capital, so above news is most welcome. ''The Canarian island of La Gomera is aiming to be powered 100% by 'green' energy sources within 12 years, slashing its power costs by 37%. La Gomera, just off the coast of Tenerife, will be the second island in the region to try to go completely 'renewable' after El Hierro attempted it between 2014 and 2016. The latter survived for months on wind energy alone and, in 2016, covered 39% of its electricity needs using wind farms – then, in January and February this year, had all 10,700 of its inhabitants supplied entirely by renewable sources for 18 consecutive days. 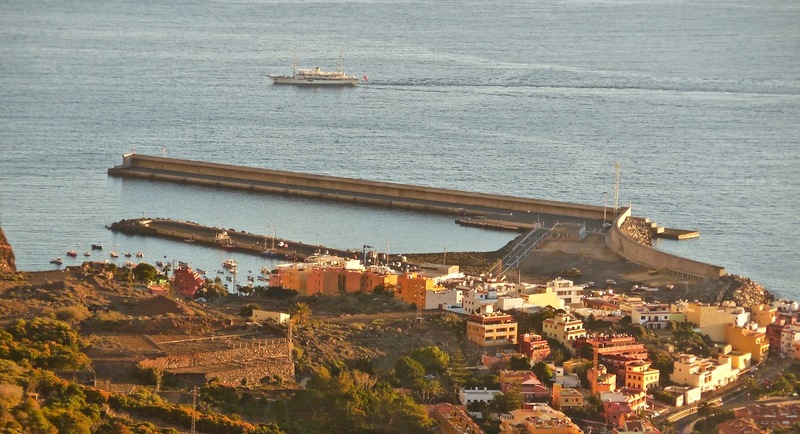 But La Gomera's plans are far more ambitious – the westernmost island in the Canaries (Ed: no, that's La Palma) currently depends upon fossil fuel for 99% of its power needs and, aside from a handful of solar panels owned by private individuals, has just two wind generators of 0.4 megawatts (MW) of power. Despite La Gomera being famous Europe-wide for its extensive forests, being the home of the Garajonay National Park and a pioneer in 'eco-tourism' dating back over 20 years, its obvious potential for powering itself through entirely renewable sources is wasted more than anywhere else in the Canary Islands. The regional government wants to turn La Gomera into another Iceland by 2030, mirroring Europe's northernmost country's 100% green energy supply. By then, it aims to have enough wind farms to create 8MW of power, sufficient solar panels to generate 5MW, and for 20% of the island's cars to be electrically-powered. The overall objective is for the island, whose population is twice that of El Hierro and which has tourist resorts with capacity for 800 visitors (Ed: surely an error - see this post), to be entirely fossil-fuel free and rely on green energy for its electricity, heating and transport – lorries and buses will be electric or hydrogen-powered. Hydrogen generators, water pumps and storage systems are being analysed as back-up for when there is insufficient wind and sun to cover the whole island's energy needs. While all of La Gomera got some decent precipitation over the past few days, the northern regions received a lot of rain yesterday. The weather station at the visitor's centre above Agulo reported just over 70 mm of rain yesterday and the station in Hemigua recorded almost 40 mm. The above video by gomeraverde.com shows one of the many waterfalls in Agulo yesterday. The next few days should bring sunny spells but also further showers to La Gomera and some of these may again be heavy with a risk of isolated thunderstorms. Caution is advised when out and about, even when it is not raining, as rocks and soil may have become unstable due to the rain and will expand during sunny spells. 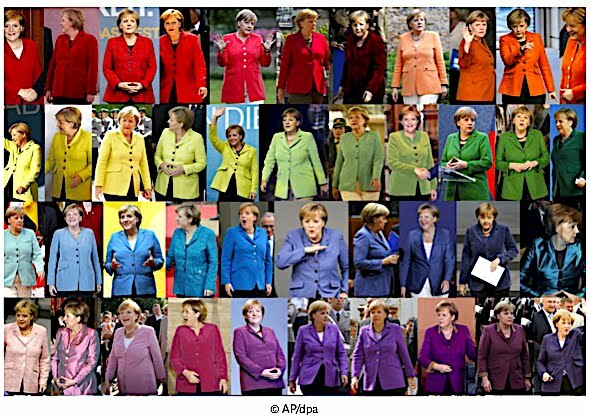 The German chancellor and the many variations of her trademark uniform of blazer and trousers. We still don't know if the the German chancellor Angela Merkel will find the time to spend a private Easter holiday once again in La Gomera, as she did last year when she visited this island for the sixth time (click to read more about it...), but we do know that La Gomera is her ''favourite island''. 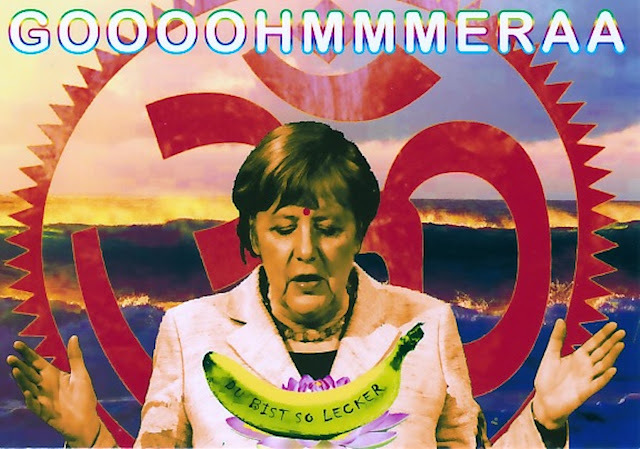 In a recent interview broadcast on German TV she was asked if she would consider moving to La Gomera after her term as chancellor ends in 2021, she smiled and said that she could well imagine doing just that in retirement. The fact that at least one of her aides has recently taken up part-time residence in La Gomera adds to the speculation. I can now reveal that the current 'most powerful woman in the world' is indeed planning a move to La Gomera, but not for retirement. Instead of putting her feet up in the sunshine with a good book and just relaxing, she is instead planning to start a business here. As she has managed to create a unique fashion style during her many public appearances in a uniform-like outfit of blazer and trousers, she now intends to promote and commercialise this style under her own label once she has left the political stage completely. Indeed, during her last visit to La Gomera she has viewed several shop premises in Valle Gran Rey which are for sale or lease. The most touristically developed town in La Gomera's south-west attracts more and more conservative German tourists who would be the ideal customer base for her outfits. There is also a large number of ageing female German residents in La Gomera who would benefit from updating their attire with the help of the planned new designer label outlet 'AB', i.e. Angelas's Blazers. Last year Mrs Merkel and her husband Wolfgang Sauer were also enquiring about the possibility to produce the garments in La Gomera for exporting bespoke blazers worldwide and the commerce and industry department of the island's government has pledged its support as they expect some local women who already have the necessary skills will find badly needed well-paid employment with the new label. Local gossip has it that 'Modas Merkel SL' is supposed to initially open a small atelier and workshop in La Gomera's north which is renowned for its skilled craft workers. Merchandising Mrs Merkel is well underway in La Gomera. Above is a fun postcard which I bought a couple of weeks ago at the organic farm shop close to the bus station, one of the shops where they sell a good selection of Merkel-themed cards by a local artist called 'Alex' (?) I believe (sorry, but there's no copyright or other information printed on the cards). More welcome rain showers are expected today and a status 'yellow' weather warning has been issued for toady, Friday March 29th 2019, for rainfalls of up to 15mm in one hour. Isolated thunderstorms may also form. Caution on roads and hiking paths is advised. For the coming days more showers are forecast, but again with good sunny periods at times. 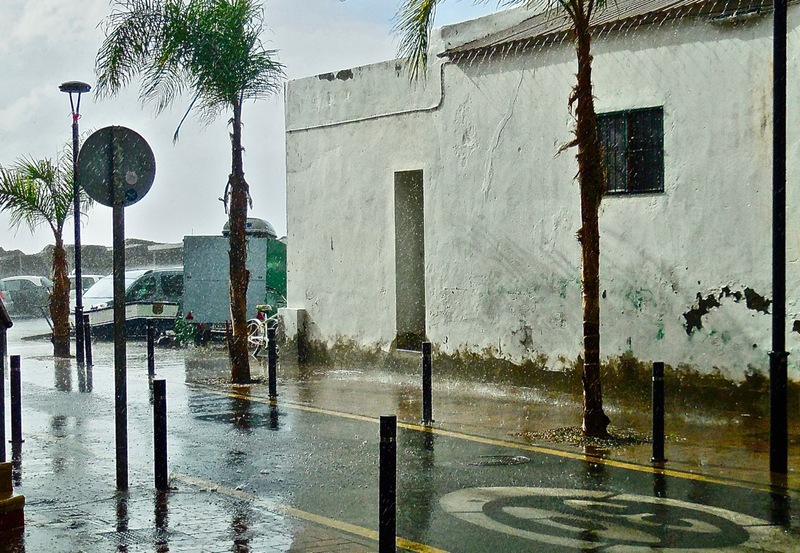 After weeks of extremely dry and dusty conditions some significant amounts of rain fell all over La Gomera this morning. In the southwest up to 16.4 mm ( in La Dama) had fallen and most of the island had received between 7 and 14 mm by 10 am. There's a status 'yellow' weather alert for the western Canary Islands for rain up to 20 mm in one hour and for isolated thunderstorms, valid until tonight. Caution is advised on roads and hiking paths. For the next few days some further rain showers may be expected, but with good sunny periods too. The direct ferry between Los Cristianos and Valle Gran Rey which had been out of service for some time due to the annual testing and inspection of the vessel in Santa Cruz de Tenerife, arrived back in the port of Vueltas late last night and is operating scheduled sailings from today and bookings can be made through the Armas website once again. Hello there, just to let you know that I'm still on the ball, BUT I'm having minor 'accidental' health issues and major issues with my internet connection - hence the absence of more regular posts. FERRIES: The connection to V.GR. is suspended temporarily due to a 'technical revision' of the vessel serving the connection. It is expected to be back in service with a new timetable very soon. Keep the fingers crossed ! WEATHER: We've had around 20mm of rain today in V.GR.. A good bit, yes, but only temporarily relieving the drought. Hurray anyway, and I've shared a few beers with local farmers who were grinning like children at Christmas. More and more details soon, hopefully. 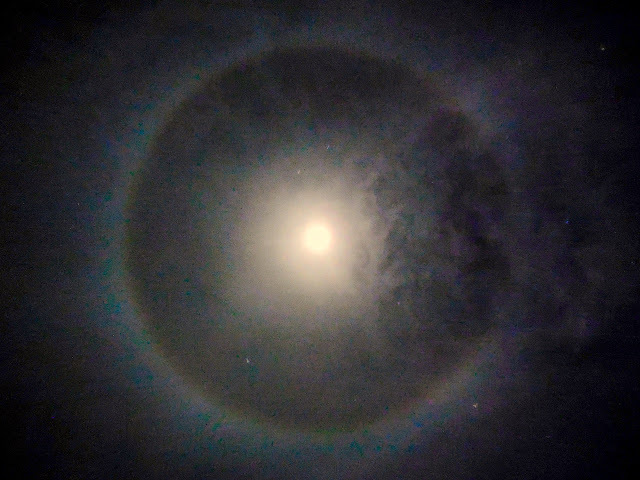 By the way, above image of a halo around the moon was taken about 40 minutes ago. Good night. The port of Valle Gran Rey situated in Vueltas handled about 158.000 passengers in 2018, most them using the new high speed car ferry service introduced by Naviera Armas towards the end of 2017 and the smaller Fred. Olsen passenger ferry which arrived in the autumn of 2017. The latter also sails to La Gomera's southern port of Playa de Santiago which handled almost 41.000 passengers in 2018. I took the above image of Vueltas ln late December 2017 when a small luxury cruise ship passed by at sunset. La Gomera's island government through their La Gomera Film Commission has announced castings for extras and secondary actresses for the shooting of a Neflix series here in spring. The first casting will take place in the visitors centre near the beach in the island's capital on the 4th of February 2019 and the following day in the tourist office in La Playa, Valle Gran Rey. See poster above for the times. 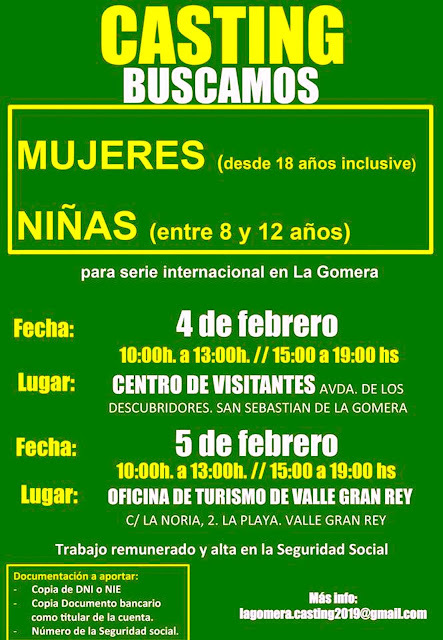 They're looking for women of all ages over 18 and for girls between 8 and 12 years old. 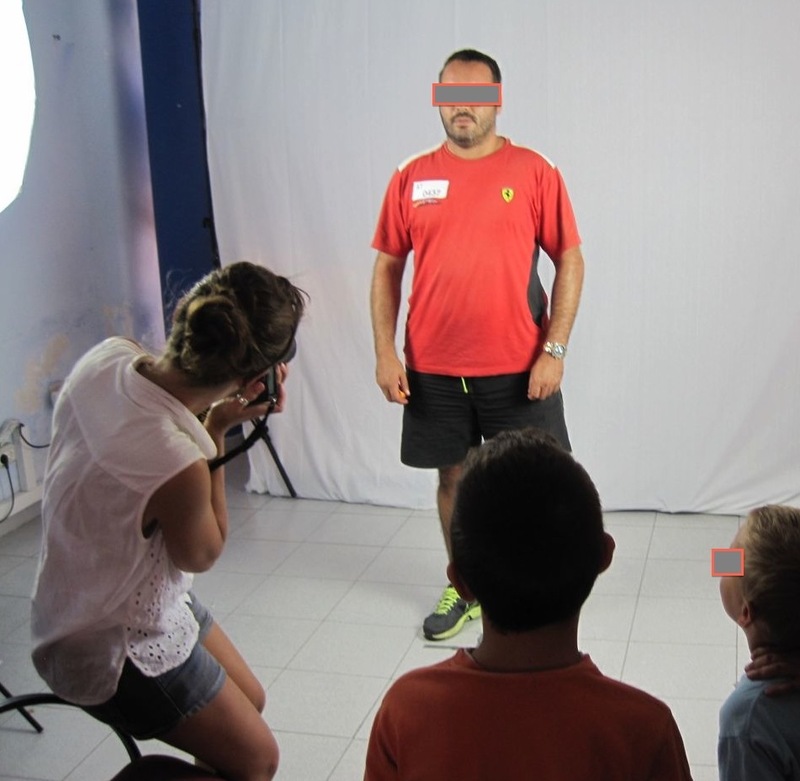 All applicants must bring copies of their Spanish DNI, or their foreigners registration number (NIE), their social security number and a document showing that they have a bank account. Selected budding film stars will be paid and the work which is handled here by Sur-Film is insured. More information can be had by contacting above email address. This time males need not apply. The above image was taken during the casting for Ron Howard's 'In The Heart Of The Sea' in 2013 when I was very lucky to get a lot of work as a double. Below each post there is a link which you can click to leave a comment. If it says 'No comments:' that just means no comments were published yet. Just click that line and a new small window will open allowing you to comment. If you want to contact me privately please leave your email address in a comment not to be published. For commercial use of any material from this blog please contact me by leaving a comment. Copyright text and photos: lagomera1.blogspot.com - unless stated otherwise . Powered by Blogger.